What a better way to welcome summer than by whipping up a bunch of tasty dishes with friends and family. Memorial Day is a time when the temperatures are rising, delicious fruits and veggies are coming into season, and sales are popping up left and right. If you’re throwing a Memorial Day get-together, you don’t need a massive budget or fancy grill. For the perfect Memorial Day BBQ, simply follow our Basket Budget Menu. Start the party with a refreshing beverage for the adults in attendance to enjoy. Alcohol can be expensive, so we recommend making one large batch of your seasonal beverage and advising those joining the party to bring their own booze if they’d like to keep drinking throughout the evening. Because of the goodies you’ll add to the sangria, you can really make one bottle of wine stretch. Better yet, you don’t even have to buy the fanciest, most expensive wine on the shelf. Adding your own ingredients can sweeten up the flavor and create your own unique twist. Once your fruit has been sliced and diced, place into a large pitcher. If you want to get your Martha Stewart on, use a cookie cutter to cut pineapple chunks into star shapes. Add 1 cup of orange juice for sweetness, if desired. Pour the red wine on top, and allow to sit in the fridge for 30 minutes prior to serving. Savings Tip: Cherries, pineapples, and apricots are all in season in May. 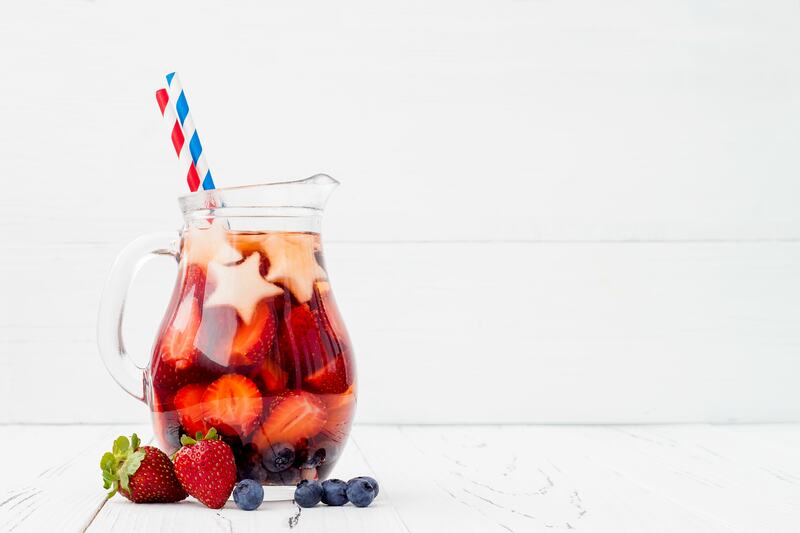 Find lower prices on these tasty fruits to mix and match into your sangria. Bonus Basket Savings: Budget tight? Purchase frozen fruit to add into the wine. The flavor will still be there and the fruit will keep the wine cooler longer. Want to know the beauty of a summer salad? You can add anything you want (or anything that’s on sale). 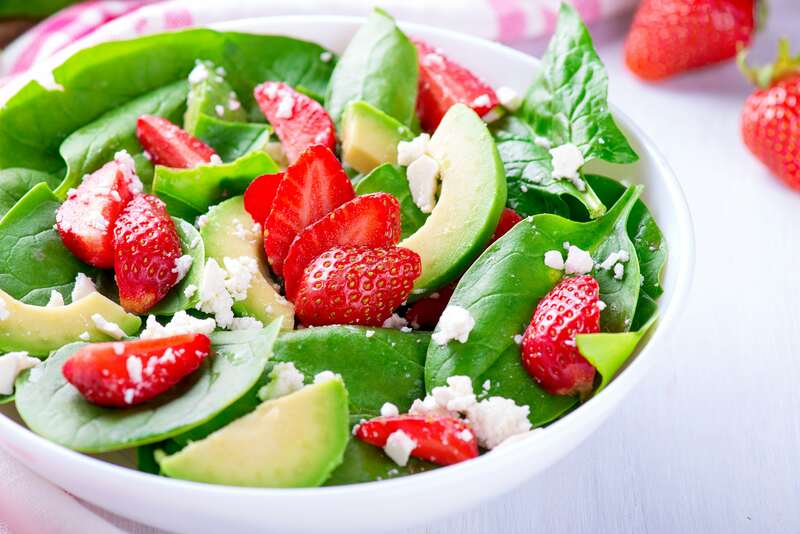 A scrumptious summer salad can contain leafy greens and legumes, nuts of your choice, strawberries, pears, cherries, and more. In a small bowl, whisk together the lemon juice with the sugar, mustard, and sea salt. Whisk until the sugar and salt are dissolved. Add 3 tablespoons of extra-virgin olive oil in a slow stream, continuously whisking until the dressing is well blended. Season with sea salt and freshly ground black pepper to taste. Whisk in the remaining olive oil if desired. Savings Tip: Basket will show you the best prices for produce near you. Adding zest to fresh fruits and veggies will brighten up you BBQ. Okay, no Memorial Day BBQ is complete without some grilling. Meat is typically the most expensive item on your grocery list, so stretch where you can. For the Basket Budget Menu, we like to grill up some classic burgers and chicken skewers. 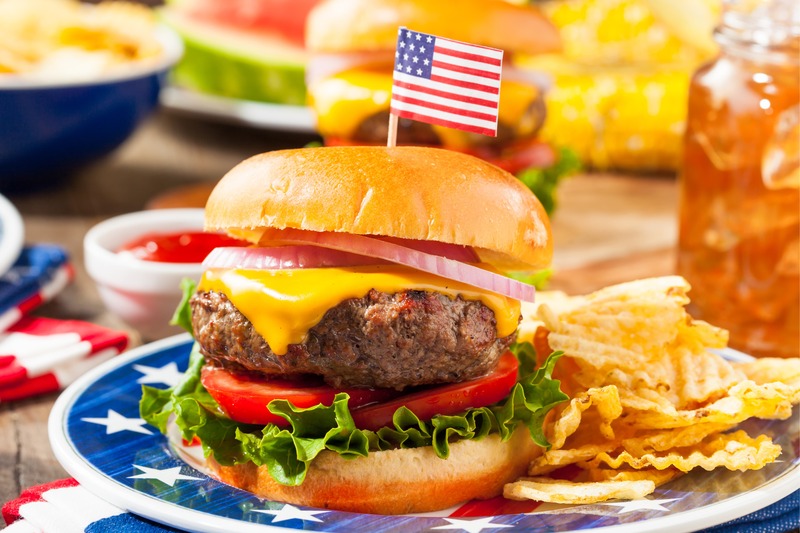 It goes without saying that Memorial Day is a great time to find sales on ground beef, pre-made patties, and condiments like ketchup and mustard. Check Basket for the best prices near you to stock up. Next, consider some tasty skewers. Our recipe calls for chicken breast, but for any vegans or vegetarians in attendance, simply switch out the chicken for additional veggies or add hearty mushrooms. See a pattern here? Fresh fruits and veggies are the way to go, and in-season pineapple can add juicy flavor to every dish! In a large bowl, combine 1/4 cup soy sauce with one cup water, 1 clove of minced garlic, and 3 tablespoons of brown sugar. Combined, this makes a mouthwatering teriyaki marinade. Cube chicken breasts and put in a large glass dish with the marinade. Keep covered in the fridge for at least 4 hours. Chop the bell peppers and onion into squares, and utilize the chopped pieces of pineapple remaining. 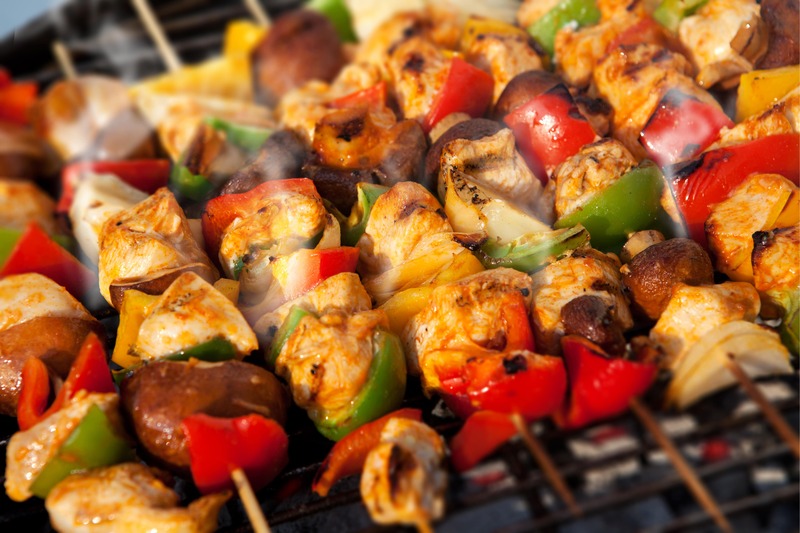 Build your kabobs on the skewers, making sure to alternate chicken, bell peppers, and onions. We’ll grill the pineapple last to ensure they cook evenly. Place on the grill, and close the lid such that the radiant heat cooks the chicken all the way through. Be sure to periodically turn the kabobs so all sides get grill marks. When the kabobs have grill marks on all sides, move them to the cooler outskirts of the grill and place the pineapple in the center to grill. Regularly turn the pineapple to make grill marks on all sides. Remove from heat and attach pineapple to skewer. You’re ready to serve! Savings Tip: Often ground meat is cheaper than pre-made patties. Be sure to see what’s on sale before placing into your cart! Bonus Basket Savings: Take a look in your dressing aisle. A teriyaki dressing makes an excellent marinade when cut with a 1/2 cup of water. If it’s on sale, save yourself some trouble. 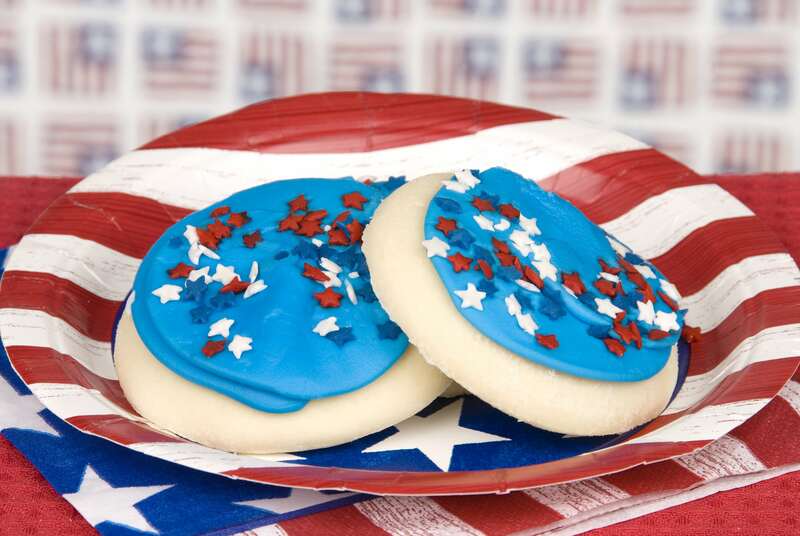 It’s Memorial Day – the grocery store will be rampant with sales. For snacks and dessert, don’t get fussy. Chips and dip routinely go on sale during this time. Grab three bags to pour into red, white, and blue bowls for guests to munch on. Pick up a few packs of cookies that you can place onto platters, and even dish up some diced fruit to continue with your theme. Don’t be shy about asking guests to bring some tasty treats, either. Chances are they’ll want to bring something for dessert, as you’re providing them with the main meal. Most Importantly: Remember what Memorial Day is all about. At the heart of this holiday, it is a time to honor those who died serving our country. Even if your budget isn’t massive or your spread isn’t gourmet, take time in your BBQ to pay respect to those who have fought for our freedom. Will you be trying any of these dishes? Tweet us at @BasketSavings to send us pictures!